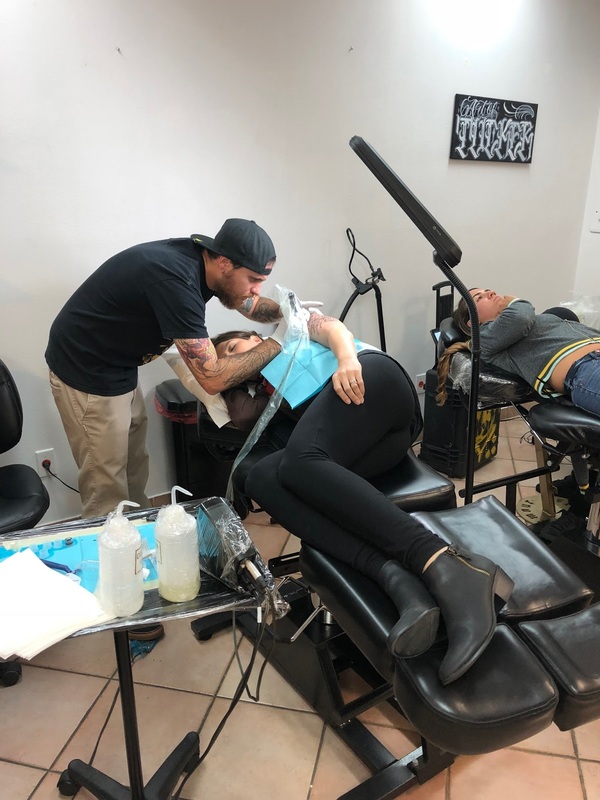 This weekend, Matt and I drove to the southeast coast to get my tattoo. 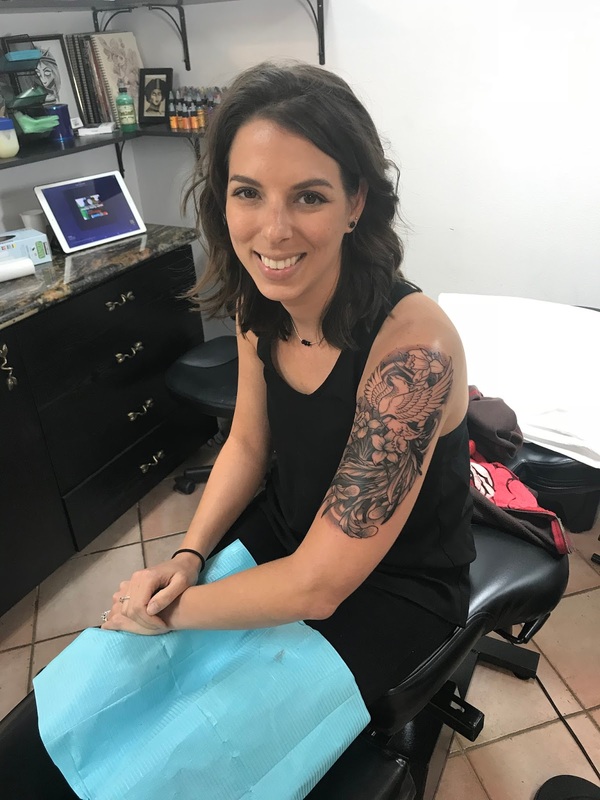 If you recall, I wrote about wanting to get my second tattoo while in Fort Lauderdale for the A1A 5k. I ended up meeting my artist and putting down my deposit, but it was too short-notice to actually get anything done at that time. That weekend, I emailed Phil some sketches I liked and he took some time designing an original tattoo based on those ideas. The final concept was gorgeous and everything I wanted. We set my appointment for 3pm on March 18. These photos are what I sent Phil. So, on Sunday I found myself at Into the Woods ready to go. The entire tattoo took about six hours including breaks, so we were there pretty much all night. It was worth it, though, for the detail and perfectionism Phil put into this piece. After being in this position for basically 5.5 hours, I did my squats to loosen up haha! Like with my back tattoo, the outlines didn't bother me much. 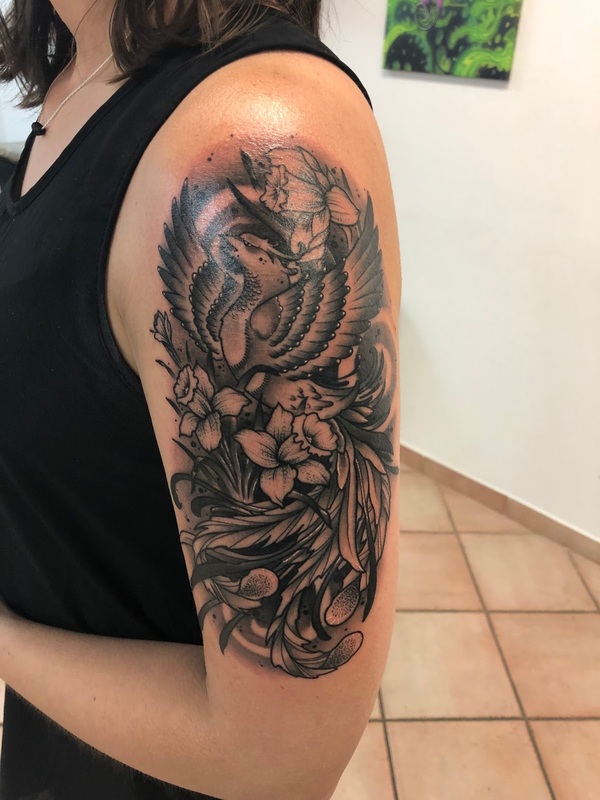 There were a couple areas close to my armpit, inner arm, and the very back of my arm that were more sensitive, but generally I did well with this kind of pain. It just feels like scratching. It does get a little tedious after a few hours of it, but that's to be expected! Lines done, starting the background. After the outline was done, Phil worked on shading the background. I have never had shading done before and it was definitely uncomfortable. Where line-work feels like scratching, the shading felt like burning. Again, though: worth it. He was meticulous in creating a gradual fade in the background, and the edges are a little feathered and soft. He added some spot details that give the illusion of ash rising around the phoenix, as I did not want literal flames. When we first discussed the piece, the background was the part I was unsure about getting, and it may be my favorite part of the finished piece. At this point, we had been at it for a few hours and I had the option to stop and come back some other time to finish. I loved the way the half-done tattoo looked and played around with the idea of keeping it this way. But, Matt and I agreed that 1) we should trust the artist because he knows what he's doing and 2) if I'm going to get more done, I may as well do it while were there already. I was holding up fine under the pain of the needles; the worst pain was actually in my hips and legs from lying on my side for so long! Phil mentioned that I sat better than 90% of his other clients. I think people are impressed that we did this all in one sitting, but really the pain never went above a 7, I think! Phil really loves working with color, and at one point he was like, "You're killing me doing this in black and gray!" 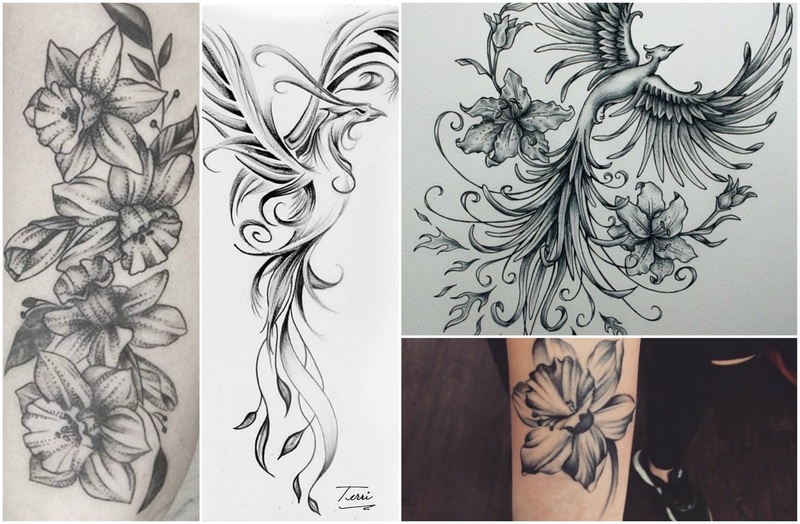 My biggest concern with shading is that I don't like when tattoos look too dark and take on a muddy, flat look. Phil assured me he understood my concerns and that were would be lots of dimension and highlights. Phil went to work on shading the grass, daffodils, feathers, and phoenix. There were some parts of the process where I worried the piece was getting too dark, but this is why I'm not an artist. 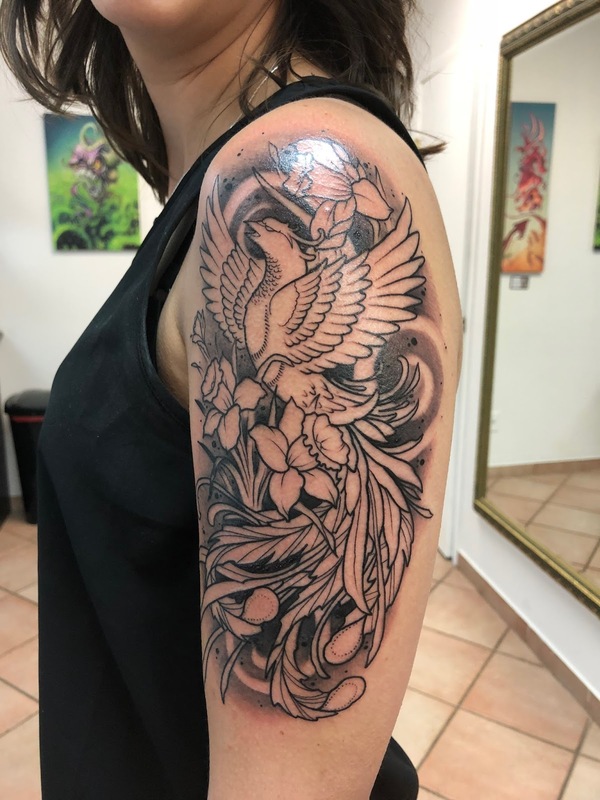 By the time he put in the finishing touches - including white highlights around various feathers - the tattoo looked anything but dark and flat. Now I have to deal with the next couple weeks of healing, but so far everything has felt fine. 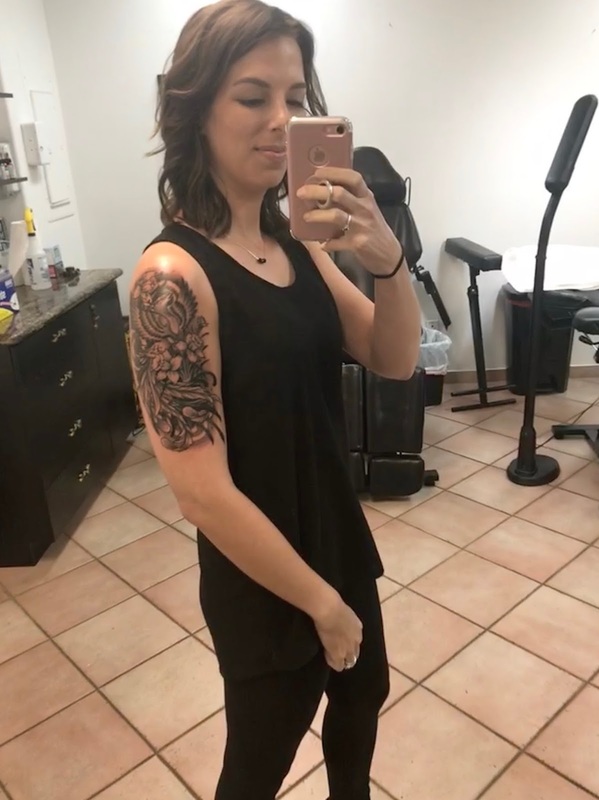 I feel, like I did with my first tattoo, that it was a part of me long before it physically made it onto my skin, so it feels natural and like it truly belongs there. Obviously there are so many reasons to choose the theme of rebirth for a tattoo. While my first one had a pretty literal meaning for me, this one has a variety of memories and emotions wrapped up in it. I love how delicate the flowers are and how powerful the phoenix's face is. 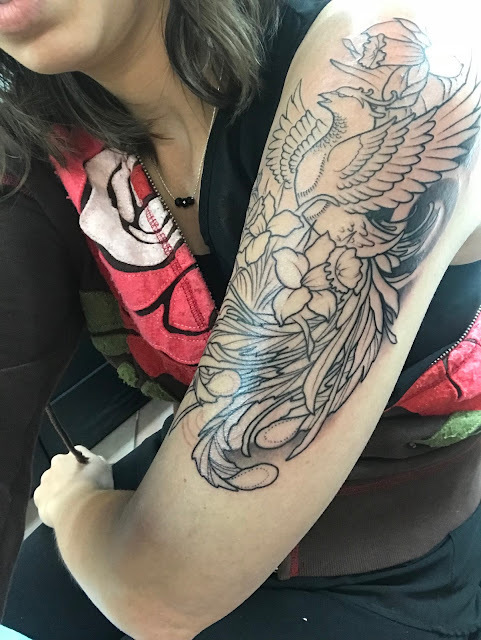 The juxtaposition of softness and beauty with the power and strength of the bird is exactly what I wanted. I can't wait to see how it looks as it heals completely! IT LOOKS SO AWESOME! In these pics I can really see the white highlights and the ash in the background... amazing!!! Love it....you are so brave! I can't remember seeing a pic of your back tattoo...I'm sure I have...but just don't remember it. 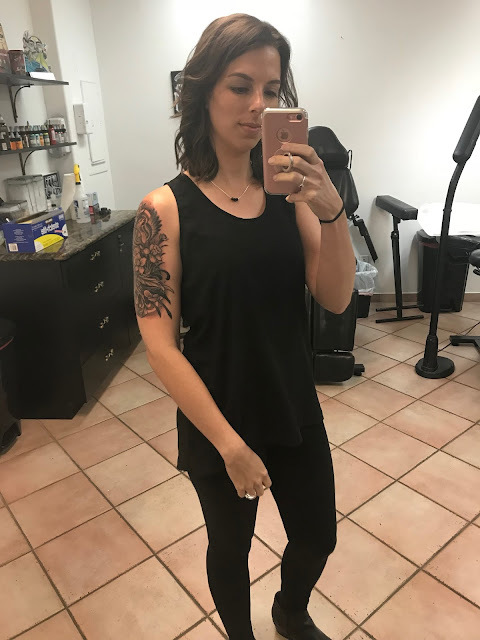 Your tattoo looks gorgeous!! Did the artist draw the whole thing himself? Are you going to add colors to it, or just leave it in black? It looks great either way. It looks great. The video shows it off well.